This test is generally used to locate cracks and surface defects in a wide range of products. But in particular, it is employed to detect fatigue cracks at points of local high tensile strengths. The name "Magnaflux" is commonly associated with this process. This method is a relatively simple and easy technique. It is almost free from any restriction as to size, shape, composition and heat treatment of ferromagnetic substance. This method is restricted to magnetic materials e.g., iron, cobalt, nickel. etc. 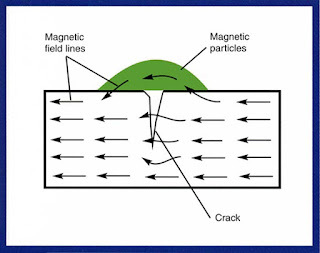 This test is based on the principle that if there is flaw in the magnetic material through which a magnetic field is allowed to pass, the lines of magnetic force or flux will be distorted near the flaw and lines of magnetic flux will be uniform for magnetic materials which are defect free. This test is performed by magnetising the substance and the immersing the test piece in a bath of kerosene oil containing iron oxide powder. One can also use the coloured power. 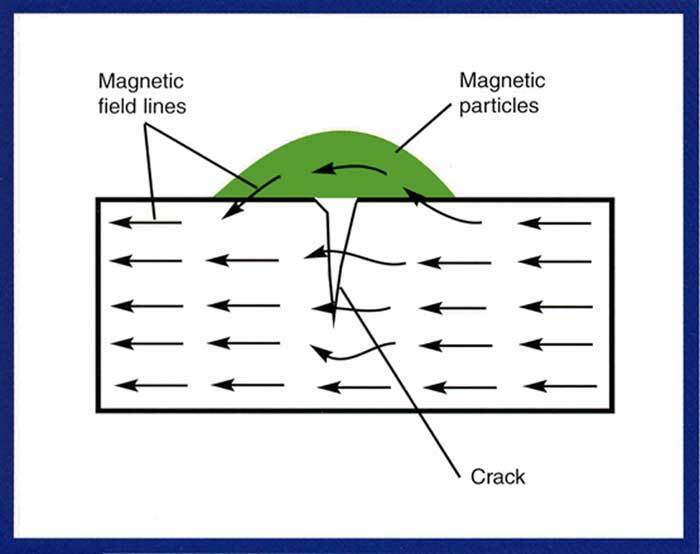 If a crack or void lies across the path of the magnetic flux, each side of the crack or void becomes a magnetic pole which attracts iron powder. The accumulation of iron dust on the crack portion of the sample reveal the crack. This test can detect both internal and external defects. One can detect the cracks caused by quenching fatigue failure in welding, blow holes in castings and grinding operations by this method.